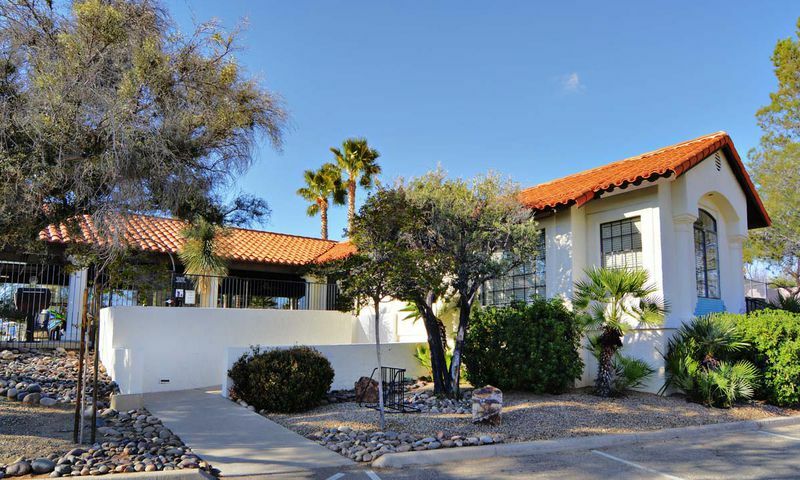 Portillo Hills is a 55+ community in Green Valley, Arizona. It is run by two different homeowners associations (HOA) that govern all 118 single-family homes. Active adult homebuyers are drawn to this age-restricted Green Valley neighborhood for its larger lot sizes along quiet cul-de-sac streets. Residents of Portillo Hills have access to an amazing lineup of indoor and outdoor amenities provided by Green Valley Recreation (GVR). In addition to a network of recreation centers throughout the area, residents enjoy amenities within their neighborhood. As a part of Green Valley Recreation (GVR), homeowners pay a membership fee to access a network of facilities found throughout the Green Valley area. Madera Vista Satellite Center is one of 13 GVR facilities. It s located within the Portillo Hills community, which means residents never have to travel far to swim or relax in an outdoor pool and spa. An outdoor ramada equipped with a kitchenette and two grills, two shuffleboard courts, and a lighted tennis court makes it easy to get to know neighbors. The Madera Vista clubhouse even has a 777 square-foot meeting room perfect for hosting a small gathering or neighborhood meeting. Throughout Green Valley, GVR s 13 recreation centers include 24 meeting rooms, five fitness centers and numerous hobby rooms. Sports-minded individuals will enjoy access to 13 swimming pools, dozens of sports courts, and parks. With fishing lakes, parks, miles of trails, and more Portillo Hills residents can take advantage of Southern Arizona's warm climate while staying physically and socially active. Pierce Homes built the community s 118 single-family homes between 1993 and 1998. Portillo Hills resale homes have two to three bedrooms, two to three bathrooms, and an attached two or three-car garage. Typically between 1,500 and 2,500 square feet, homeowners enjoy main-level living on spacious lots with back and side yards on quiet cul-de-sac streets. Portillo Hills is one of the few communities where you can find enclosed R.V. parking. The two HOAs, Portillo Hills I and Portillo Hills II, provide residents with up-to-date information and plan fun neighborhood events. GVR membership provides many services and activities throughout many facilities. There are numerous sports clubs, art classes, trips and tours, lectures, and more. Popular arts and crafts clubs like the Green Valley Arts and Craft Association and Woodworkers of Green Valley meet on a regular basis. You can meet for games like bridge, canasta, chess, euchre, Mah Jongg and more. Those who want to socialize can join a dance club, drop in on a game of billiards, or learn new hobbies by joining a special interest group. Portillo Hills homeowners live a vibrant and active lifestyle and never run out of things to do. Portillo Hills is an age-restricted community in the heart of Green Valley, Arizona. Located west of Interstate 19, it's just 33 minutes south of Tucson. Traveling farther away is never a hassle with Tucson International Airport located less than 30 minutes away. Green Valley, Arizona is a unique area where the majority of neighborhoods are age-restricted or targeted towards active adults. There are 300 shopping, dining, and retail outlets in the area, as well as plenty of outdoor recreation near the Santa Rita Mountains. Portillo Hills is a charming 55+ neighborhood in Green Valley where residents live among fellow active adults who enjoy their carefree lifestyles in a convenient area. Meeting Room - 777 Sq. Ft. There are plenty of activities available in Portillo Hills. Here is a sample of some of the clubs, activities and classes offered here. Portillo Hills is governed by two separate homeowners' associations (HOA), Portillo Hills I and Portillo Hills II. Both HOAs include 118 single-family homes. Pierce Homes built these low-maintenance residences in the early to late 90s. Most homes have two to three bedrooms, two to three bathrooms, and an attached two or three-car garage. Typically between 1,500 and 2,500 square feet, Portillo Hills' homes offer main-level living on larger than most Green Valley lots with back and side yards on quiet cul-de-sac streets. Please Note: Due to the age of this community, floor plans are not available at this time. 55places.com is not affiliated with the developer(s) or homeowners association of Portillo Hills. The information you submit is distributed to a 55places.com Partner Agent, who is a licensed real estate agent. The information regarding Portillo Hills has not been verified or approved by the developer or homeowners association. Please verify all information prior to purchasing. 55places.com is not responsible for any errors regarding the information displayed on this website.